In my version of baby back ribs, I first slow-cook ribs and vegetables in stock and white wine in a large pan on the charcoal grill. When done, I puree the vegetables to make a flavorful and smoky BBQ sauce which is then used to finish the ribs. It's quite a bit of work, but the result is very rewarding. For this recipe you will need a grill with a lid and you will need a large heavy roasting pan that fits on the grill. I use my rectangular turkey roasting pan that fits on my Weber charcoal grill. a handful of wood chips for the grill, soaked in water for at least ½ hour. I like hickory. Start grill. Make sure to load it with enough charcoal for at least 90 minutes of cooking. In the meanwhile, trim the ribs and cut them into pieces that fit into your pan. Rub ribs with rosemary. When the charcoal is ready, set the pan on the grill, add oil, then brown the ribs from all sides. Set aside. You will likely need to brown the ribs in multiple batches. Turn down the heat on the grill (if possible). Cook the onions until lightly browned, then add salt, bell pepper, chili pepper, chopped carrot, celery and garlic but retain ca. 1/2 tbsp of raw garlic. Cook for a few more minutes. Return rib racks to the pan, stack if necessary. If you stack them, you will later need to shuffle them around a few times so that they can cook equally. Add stock and white wine. Throw the wood chips on the grill (not in the pan!) and put the lid on the grill. Adjust air flow to set grill on low heat. 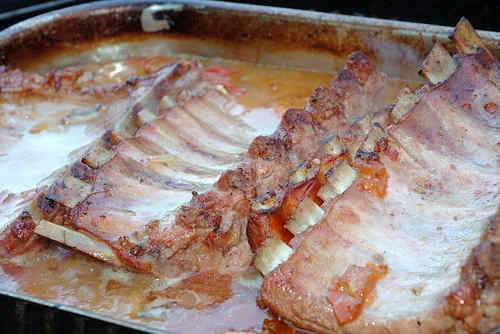 Cook ribs for at least 60 min (depending on their size, they may need up to 90 min), turning and re-stacking occasionally. Make sure the wood chips generate smoke. Should the liquid level in the pan get too low, add small amounts of water. When the ribs are fully cooked, remove from the pan. Puree the vegetables and remaining liquid with a blender. A stick blender is safest and works best, be very careful when using a regular blender with hot ingredients. Read the instructions and make sure to not overfill. Blend in tomato paste, honey and remaining raw garlic. Add vinegar or lemon juice and season with salt and freshly ground pepper to taste. Generously coat ribs with BBQ sauce. Finish directly on the grill, 1-2 minutes per side. Serve with remaining sauce. Serve with bread or rosemary potatoes, and a nice salad.